Sometimes you need to add something to your bag of tricks and that is what happened here. I've had a lathe around that would swing 36" but the biggest chuck I had for it that was any good was 20". 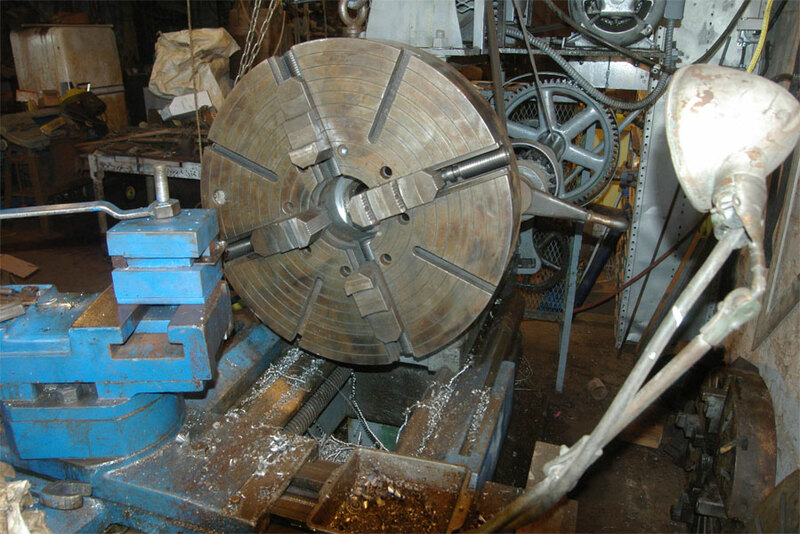 Since the clamping diameter of a chuck usually doesn't exceed its diameter and manytimes is less than that it is hard to get the benefits of a big swing lathe without a large chuck. Big chucks are usually heavy and expensive, but this one was found on Ebay at a decent price and is a fairly light weight one for its size. 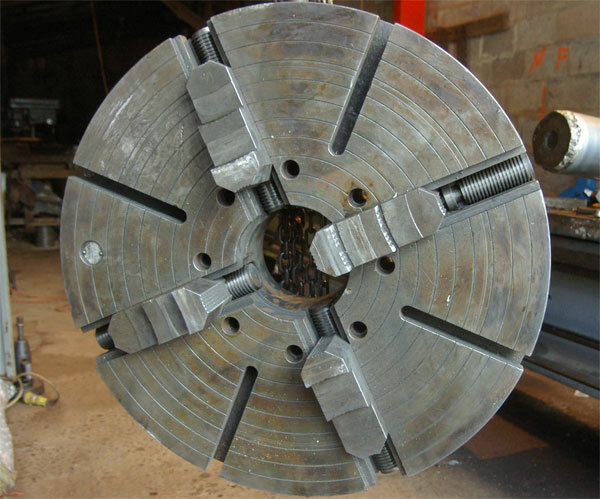 The seller said it weight 425 lbs, and the trucking company said 600 lbs, but either way that is fairly light for a 28" chuck. My preference for chucks and sort of the newer standard is for the bodies to be made of steel, but alas this is a cast iron one. Cast iron chucks are usually not as strong as their steel counterparts, but it is really hard to call a 600 lb piece of cast iron 'flimsy'. 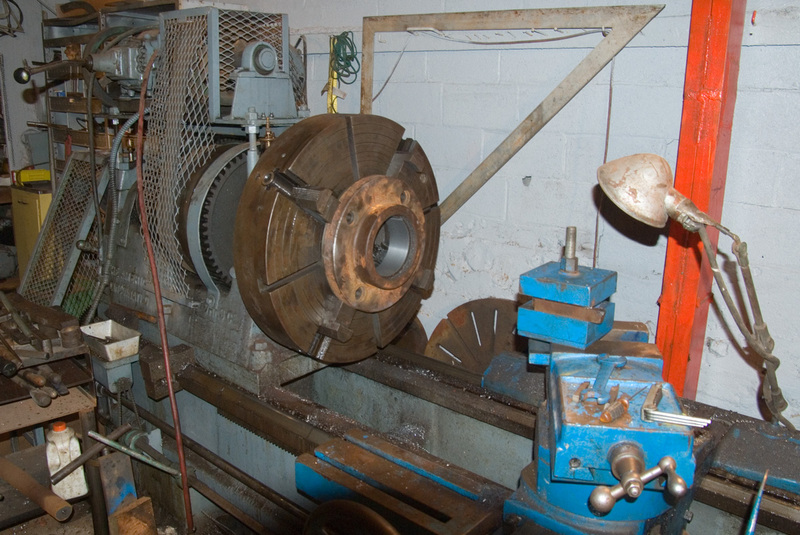 My point is simply that it is harder to overload/overstress something this large as compared to say a 10" chuck.... The jaws are 7 inches long and seem to expect at least 4 inches of contact with the screw (there is 4 inches of screw on the outer side of the thrust bearings... The center hole is 6 inches so it looks like you can grab thing from fairly small to about 20 inches without turning the jaws around or getting less than 4" of the screw on the back of the jaws. With the jaws reversed it will easily clamp its own diameter. The mounting recess is 12" in diameter, and the chuck will be held to the hub with 8 allen head bolts 3/4" by 7". 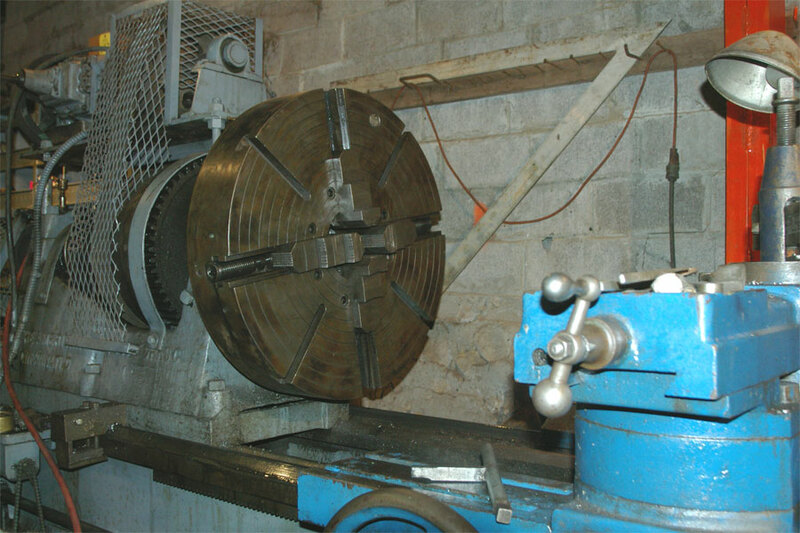 It isn't the biggest possible chuck that the American lathe will swing, but it is close enough to provide a great deal of flexibility. Previously my chuck assortment mostly stopped at 18" and had about 3" center bores. This chuck has a 6" center bore so a good sized runout hole to work in when drilling or boring. 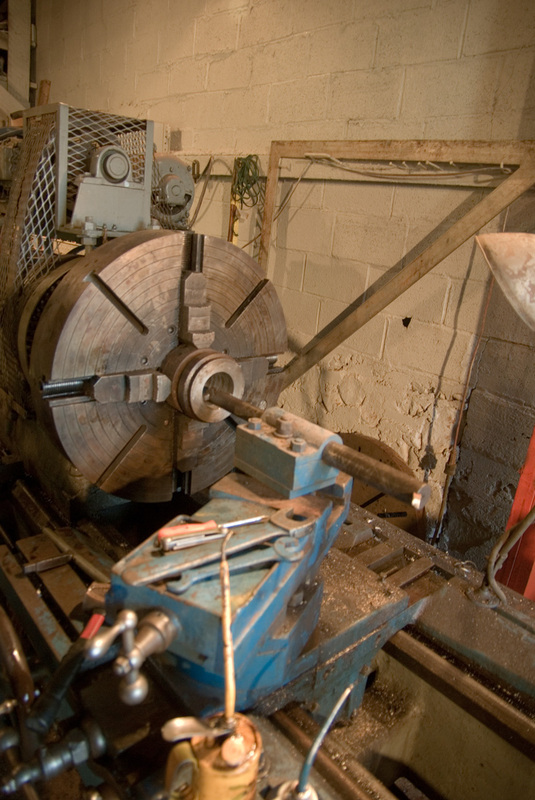 The first order of business with this chuck was to mount it on my lathe. It was intended for the American which swings 36" (with a couple extra inches for good measure) so I wasn't worried about it 'fitting', but I set it up in front of the spindle just for looks and to make sure I hadn't missed something. It clears the carriage saddle by 5 inches sort of confirming my measurements of the size. Though unlabeled, I've figured the lathe was a 30" model with a 3 inch block to make it 36" and the extra space is 'clearance' as was customary at the time. The bottom line here is, if I had found a little larger chuck, I could have used it, but if a chuck were larger than 32" it would be fairly easy to hit the saddle or the bed with any protruding chuck jaws. The back plate will be a 2 piece affair. I took a 7" diameter cold rolled rod and bored it out and threaded it for the spindle. Then I flame cut a piece of scrap plate to turn clean to 12" in diameter. It got the center hole first. I started by drilling it with a 3" drill bit and then turned it to 6.5". 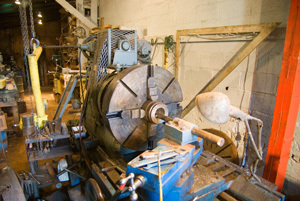 I used the grand old Cushman 24" chuck that came with the lathe for the job. It's screws and thrusts are all screwed up but the jaws are steady so it got the job done. I'll probably never use it again, but this gave me an excuse to dig it out and grease it well before I put it back on the shelf. I've never seen a chuck quite so battle scarred. 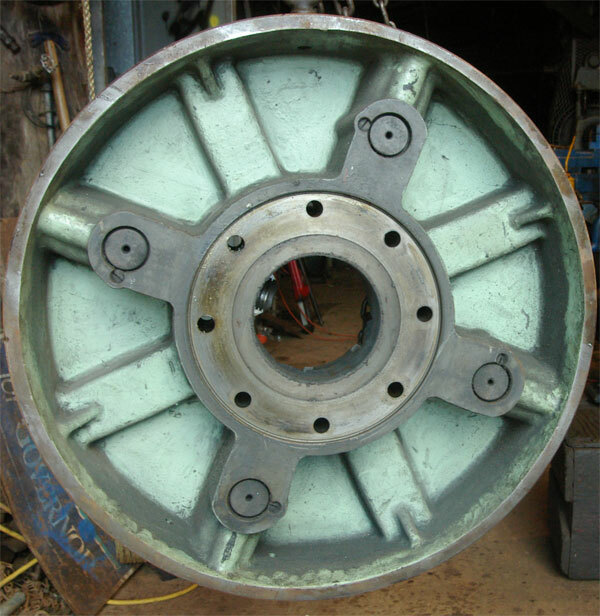 The front 1" of the hub gets turned to 6.5" and the flange plate slips on this pilot and gets welded on the back and grooved out and welded in the joint on the front. 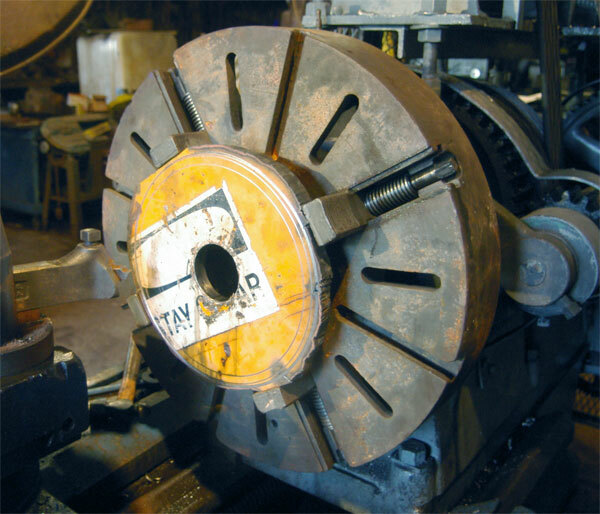 the chuck has a little shoulder in it and does not use the 6-7" area as a mating surface so the presence of a weld there won't matter as long as it isn't proud by much. 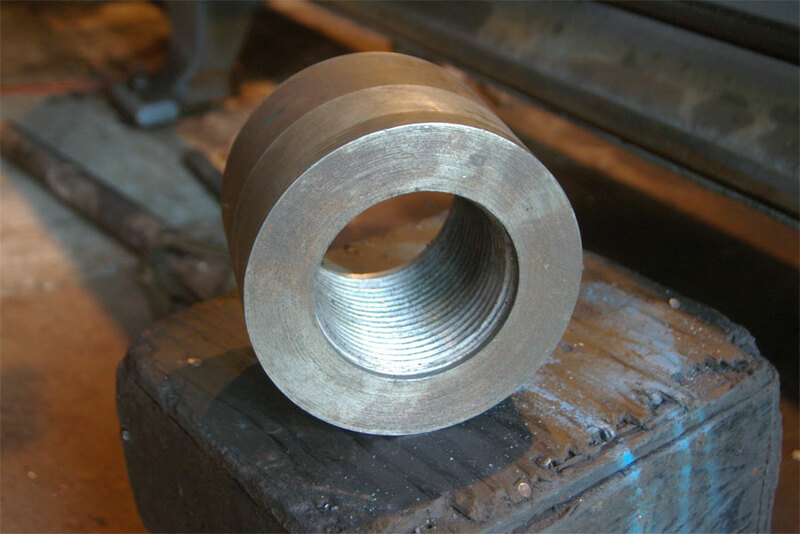 Once welded, the back place is mounted on the lathe, turned to diameter, and faced off. It is then drilled and bolted to the chuck. We used a 3 bead weld of 7018 on the back and a single bead in the groove on the front. 7018 is machinable so it got trimmed where it was a little high as the front was faced off after welding to make sure the chuck would run true. Diameter was turned to 12" to match the recess in the back of the chuck and a transfer punch was used to make the drill points. I drilled it all the way through and put nuts on the 3/4" allen headed bolts that hold the chuck on the hub. I could have threaded the plate and used smaller bolts, but then the drilling would have had to be more accurate. 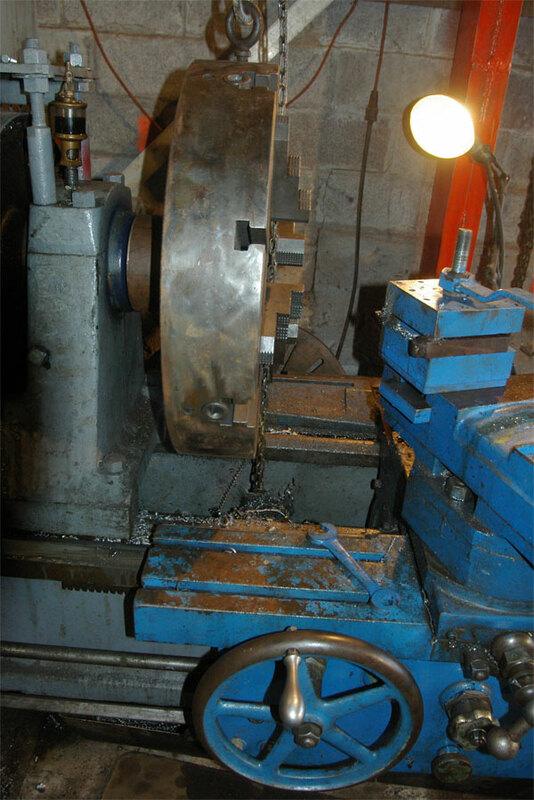 As it is the pilot hole (12" holds the chuck in alignment, and the bolts just keep it from falling off, so the holes could be a bit over size to compensate for any drilling irregularities. The allen heads of the bolts wouldn't quite fit in the countersinks made for them, so I made a couple of passes with the lathe to reduce their size a little. One of the nice things about a 4 jaw chuck is that they are more flexible as to what they will grasp than a 3 jaw scroll chuck. The jaws are about 7" long and appear to be designed to run off the screws by up to 3". There is a gap in the adjusting screw 4" in from the inside end where the thrust bearing is. With a 6" center hole the jaws bump each other when they are entirely on the inside part of the screw (3" in and 4" still on the screw). when you move the jaws to the outer part of the body, if you stick the jaws 3" beyond the chuck body, that implies you can grab something up to 20" inches with the jaws in this position. The jaws can also be screwed all the way out, and turned end for end and screwed back in. Then you can clamp on the steps of the jaw, if you are clamping on the outside. This lets you clamp something even larger.